BETTER PRODUCTION Shops Using Technology 108 MMS January 2017 mmsonline.com slotting ranging to 2×D (50 mm) in difficult-to- machine materials. Especially within the aerospace, energy and mechanical engineering sectors, production managers must bridge the gap between economic ef f icie ncy a nd high proce s s re lia bilit y whe n working with materials that are difficult to machine. 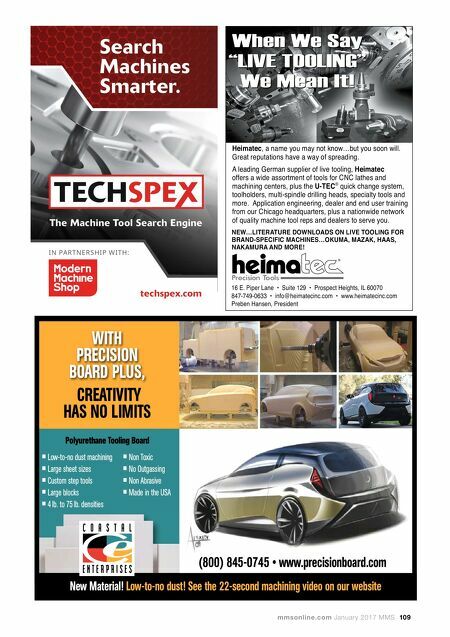 H e l l e r, w h i c h p r o d u c e s f o u r- a n d f i ve - a x i s CNC machining centers, CNC mill-turns, CNC m a c h i n e s f o r c r a n k s h a f t a n d c a m s h a f t machining, and flexible manufacturing systems, says it relies on close collaboration with its cus- tomers, suppliers and research institutes to meet ongoing demands in manufacturing. Often, the aim is to increase productivity without compro- mising process reliability. In order to equip toolholders with the Haimer Safe-Lock system, spiral grooves are ground into the tool shank. In combination with special drive keys within the chuck, the system prevents milling cutters from getting pulled out of the chuck during heavy-duty machining. Coolant- Thru! 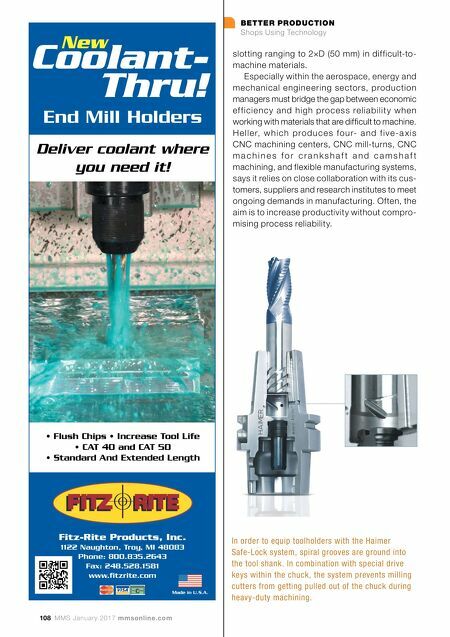 End Mill Holders New Deliver coolant where you need it! Fitz-Rite Products, Inc. 1122 Naughton, Troy, MI 48083 Phone: 800.835.2643 Fax: 248.528.1581 www • Flush Chips • Increase Tool Life • CAT 40 and CAT 50 • Standard And Extended Length Made in U.S.A.